If you're a runner or a cyclist, the list of wearables you can employ to improve your activity is virtually endless. But for those who routinely toil away in the gym, getting an insight into the likes of form, repetitions and effort levels generally isn't an option. Big companies like Garmin have, to largely poor effect, tried to introduce basic repetition counting into fitness trackers and smartwatches, while many more startups have taken aim at sports wearable's biggest blind spot and, ultimately, failed to produce a compelling device. But there is hope yet. Toronto startup Push has been developing technology for elite athletes and their coaches in the weight room for the past five years, and now the same team that brought objective data in the form of the Push Band is ready to bring its next device to strength workouts. 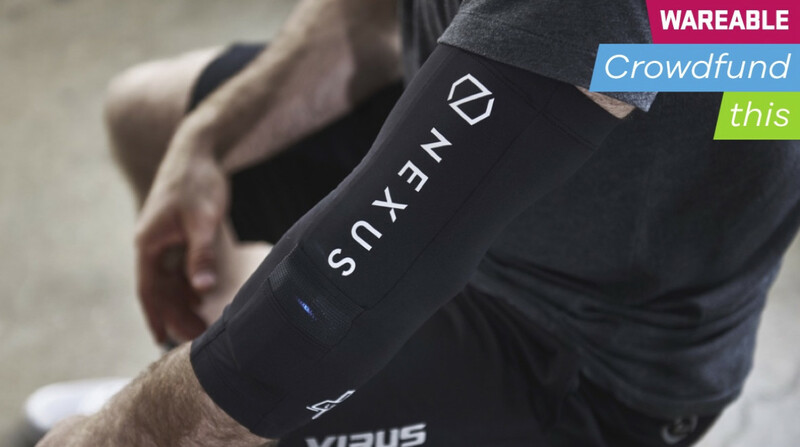 Debuting on Kickstarter, Nexus, a compression sleeve with a pod resting inside, is targeting new and experienced CrossFit athletes looking for real-time insights into their workouts. The $209 wearable is set to land in September, giving users the likes of automatic exercise detection, repetition counting, round-by-round splits, cadence, a work-to-rest ratio figure and even a power metric which calculates intensity into a raw figure. "Constantly getting asked that and seeing coaches use it in a limited sense made us explore it further and want to address that need. There’s nobody really bringing any technology to CrossFit, and there’s a demand for it. A lot of the time when you look at the injuries within it, it’s tied to pacing. It's similar to running, really. If you go out way too strong out of the gate, you get fatigued very early but you still want that workout done so your lift or your technique starts to fall away. Now Nexus can show that. "And because a lot of the elite CrossFit athletes we’d speak to constantly had a trainer there, too, we started to wonder what exactly they were recording. We quickly realised that the coach looked at how long it takes you to finish each round, counting how many reps per minute, per exercise, and seeing how that’s changing between rounds, and also looking at the intensity of the movement and trying to figure out if intensity is dropping." Identifying these areas signalled the start of the Nexus journey over 18 months ago, with the team since using the data collected in the Push database to fine-tune a new algorithm that aligns with the demands of CrossFit. With workouts blending together movements and exercises from a cardio, weightlifting and gymnastic background, simply using the same technology in a fresh form factor wasn't an option. And along with the tracked metrics listed above, the aim of Nexus is to essentially have a coach on your arm that feeds back into the companion app on the go. Once a workout is wrapped up, wearers will be able to see a breakdown of their overall performance, which also builds up over time to provide a look into long-term strengths and weakness and how workouts have varied. "We fed a lot of data we've gathered from the Push Band, but it’s different to Push, too, because CrossFit athletes don’t have the time to interact with the device in that rest period in the same way. So the machine learning algorithm has to be able to automatically detect when you’re performing an exercise and when you’re just taking a drink and maybe not doing something," Alhamad said. "And building the algorithm was very hard work. It’s taken us a year and a half, and we’re only now ready for prime time. But what gave us a ton of confidence was the testing crew's feedback over the past six months. We have 20 million repetitions in our database, at this point. So when it comes to detecting the 140-plus exercises we have, our experience with Push and these test athletes really helped us finesse our algorithm. It’s scary good at detecting, even if you try and trick it." In comparison to the software challenges, the Push founder indicated that deciding on the compression sleeve form factor and physically building the pod was a breeze. And not only does the current sleeve feature a pocket for the Nexus pod, but Alhamad also told us another section will soon be able to offer heart rate monitoring, too. "The truth is, it's not really a challenging product to build. And we knew right out of the gate that a watch-style wearable wasn’t going to work, because it's just not the ideal place or fit for an athlete. The strap works fine if you’re doing a slower workout, but if you’re jumping around and in a very fast session, the sleeve is perfect because it’s not in the way or at risk of being bumped or affecting your form," he said. Some crowdfunding projects are just a little more polished than others, and Push's Nexus certainly appears to be one of the more rounded campaigns we've looked at this year. Though the company is, perhaps riskily, attacking an untapped area of consumer-facing wearables, there does appear to be a genuine community thirsty for what this device provides, and all the signs would indicate that Nexus is ready to deliver on its aim of bringing objective data to CrossFit workouts. The fact that Push already has over half a decade of experience not only building technology, but also putting it in the hands of professional teams, such as the NFL's Seattle Seahawks, NBA's Washington Wizards and MLB's Detroit Tigers, only adds to its reliability. And the fact that the design itself, as Alhamad notes, isn't a complicated one, should allay some of the usual fears of potential backers regarding delays. We're intrigued to see how the app experience feeds into the wider Nexus experience after launch, with the Push CEO indicating that the aim is to bring a Strava-like feel to users, whether they're just beginning in CrossFit or competing in CrossFit Games. And, as ever, testing the accuracy and usability of the device will be interesting once the device begins rolling out later this year. For now, though, this appears to be one project worth backing, if you're looking to add a bit more science to your CrossFit workouts. When can you expect to tap and sync, and with what?